We had such a relaxing evening as we sailed through the harbor. This was a low keyed dinner made by the crew. The only suggestion is that they have someone official at the designated pick up spot a little early. We had trouble figuring out where we should get on the ship. This was a very unique experience on a tall ship, almost 200 years old. The main spoiler was the weather blowing rain, but the crew were very enthusiastic and went above and beyond to make it a memorable experience. The captain was very knowledgeable about the history of the area. The directions for pickup were not specific enough for strangers to the city. It wasnt made clear that the ship only sailed to the pickup point but wasnt docked there. We spent a lot of time looking for it. If you would like a unique tour, this is it. I would love to do it on a pleasant evening. I do not drink and was told that I must purchase a package that included drinks. I ended up giving away the drink portion of this package. Great experience. Good views, food and drinks. To see Sydney is one thing. To sail upon its waters is another. But to do it slowly on a tall masted ship is even larger. Dinner was simple. The crew was very interactive. They allowed us to help set a sail. If I could have change one thing it would have been less wind. One sail was all we needed. Too often we tourist are in a hurry to see things. This is one way to experience Australia. Beautiful Ship. Friendly crew, beautiful cruise along the harbor. Dinner could have been a lot better. 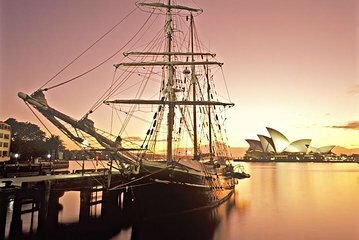 Great adventure sail during Vivid Sydney Festival. Highly recommended on any beautiful day for a different view of the harbour, the bridge and the opera house, but it is extra special during Vivid as you avoid the crowd onland, and can grab the best angle photos. This was a very good tour of the Sydney Harbour. 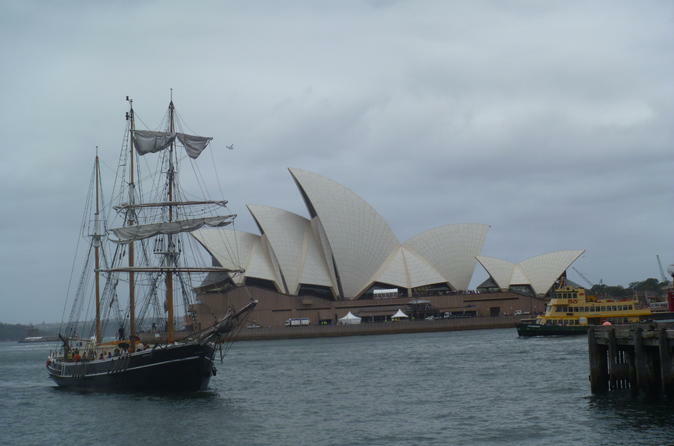 I was pleased and surprised that the ship actually sailed back to the wharf after motoring out past the Opera House. We did not get the drink package and didn't feel we missed anything. I was miffed when we received an email the evening of April 18, the night before we were leaving the US to fly to Sydney informing us that the departure location was changed from Campbell's Cove to Walsh Bay. I don't like last minute changes! However, after arriving in Sydney April 21 and going to Walsh Bay for the cruise, I understand the change was required because of security based on Vice-President Pense's visit to Sydney, so the last minute change wasn't the fault of the cruise company. Excellent tour, sailed all around Sydney Harbor, guide was great explaining everything, entire crew was excellent and the tour was very enjoyable.